On Monday, October 9th, we will be celebrating Columbus Day, the celebration of Christopher Columbus who landed in the New World in 1492. For many Bostonians who enjoy their history, families will be gathering in historical locations across the state such as Plymouth Rock in Plymouth, Massachusetts. Others will be reading up on the momentous occasion and maybe even be attending a reenactment performed in several of our surrounding communities. The activities available are endless and it’s a certainty that whatever type of Columbus Day information you’re looking for- Boston has it covered. History buffs aren’t the only ones getting into the spirit of things this October since many are attempting to bring their own authenticity of this time into their own floral studios. While many parties will be hosted to mark this special event, florists are trying to find and design with blooms that were genuine to the times. What does this mean? Well, it’s safe to say that several species such as hybrid delphinium, phalaenopsis and calla lilies were probably not around in the New World of 1492. That of course, does not mean that tables were not dressed with floral décor-it just means that the varieties which were obtainable were specific to the area. What blossoms were they picking to showcase at their holiday meals? Here’s a list of probable species we might have seen during this historic era. Wheat wasn’t only a necessity to survive, but it was also a beautiful plant that could be cut and put into vases. Bunches could also be tied together and hung in doorways or on doors as a gesture for welcoming guests into their abodes. The longevity of the stocks would have made them a cost-effective choice for décor plus the color was conveniently versatile with any furnishings present in the home. Wheat is also a sign for “fertility”, “love” and “charity; three themes that were very important at this time. Tobacco was not only a huge cash crop but also a beautiful plant that bloomed pretty flowers during the late spring and summer months. Commonly referred to as “Nicotiana”, the stems could be cut and arranged for centerpieces that not only made a lovely display but also gave off a noticeable scent that may have been aromatic to homes. Flowers range from a white to soft pink shade which would have “dressed” a special meal perfectly. Wild Lace Flower was another stunning wildflower that graced the hillsides of the New World during the 1400’s. Due to its ability to survive with little to no nourishment, lace flower was likely to have been cultivated in mass amounts across glens and meadows. This variety was a favorite for children who could load up their baskets with stems of these dainty blossoms to bring home as a present to their mothers. Their white (cream), flat headed bloom closely relates to the fabric for which it is named after and comes from the carrot family that grows similar foliage to the vegetable. Today, lace flower is still a favorite for many who love the natural appearance of a floral arranging and can be readily ordered from your local florist today. If you were born in October, the gemstone that represents your birth is the beautiful opal. Opal is a one of a kind stone as is often looked upon as being a favorite to many who adore the multi changing colors of the rainbow that can be seen on its surface. Some cultures respect the gem as being the most impressive of all because it is believed they hold magic powers due to the unique properties they possess. The gem holds several meanings as well such as hope and purity but can also translate into a sign meaning loyalty or faithfulness, which is why it is the official gift for 14th and 18th wedding anniversaries. Lure also says that the Greeks believed opals had healing properties to cure ailments associated with the eyes and could possibly even have the ability to give the owner insight into the future. Opals are undeniably stunning with their multitude of distinctive traits which is why many florists are constantly trying to mirror this beauty with similar eye-appealing arrangements. Unlike gems such as rubies and sapphires that are much more easily matched to red and bloom blossoms accustomed to a designer’s inventory, opals require a bit more thought when attempting to mimic their similarities in flowers. It isn’t every day that florists come across translucent or opaque varieties when doing their ordering so they have to use a little creative thinking to replicate the presentation. The good news is, there’s just about every tint imaginable within opals, giving way to the possibility that you can work with several different shades at one time. Another approach is to study more of the translucent side of the stone, which can open a door into a whole other set of options. Depending on what the clientele’s objective and preference is when ordering, designers might gain a bit of wiggle room around the species they choose as well as the texture they plan to construct the centerpiece. Baby yellow ranunculus, dahlias and roses make a wonderful gift for an October birth child because it relies heavily on the softer tones of yellow that many opals possess. The gift recipient will also appreciate the upbeat and happy appeal that is sure to brighten up any day. A simple bouquet of pink peonies may also be the answer because almost all opals have a strong pink pigmentation laying on the the surface. 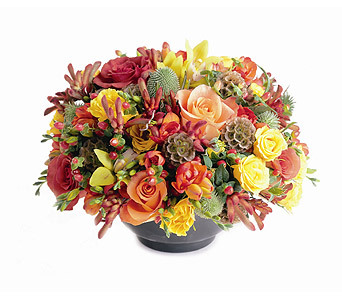 Stick again with the lighter varieties and you can’t go wrong with this springtime arrangement that still packs a “WOW” throughout the fall. 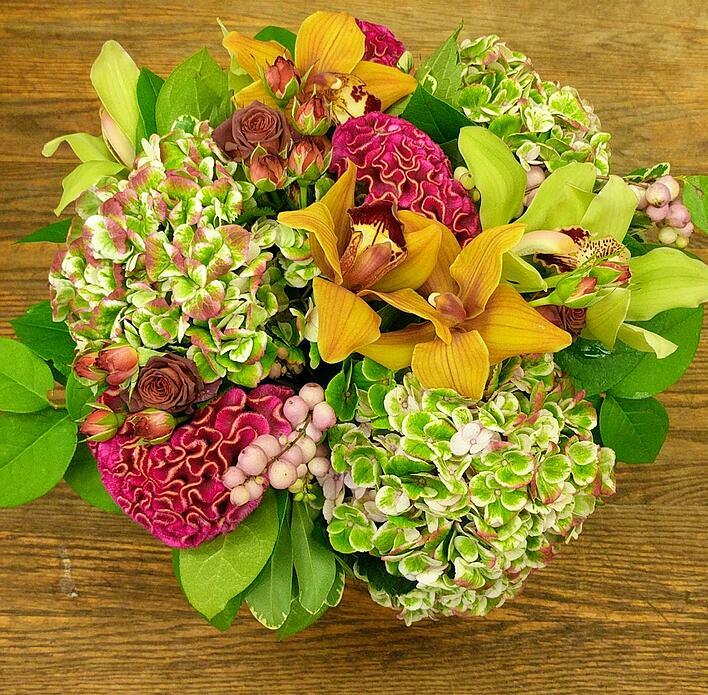 I love this combination of soft and severe blooms that when mixed together cause quite a show stopper! Purple thistle, mauve roses, white ranunculus and black privet berries perfectly match the allure of October’s gemstone while offering a sultry and seductive charm. Featuring orchids and hydrangeas, Indian Summer lets us hold onto summer just a bit longer. 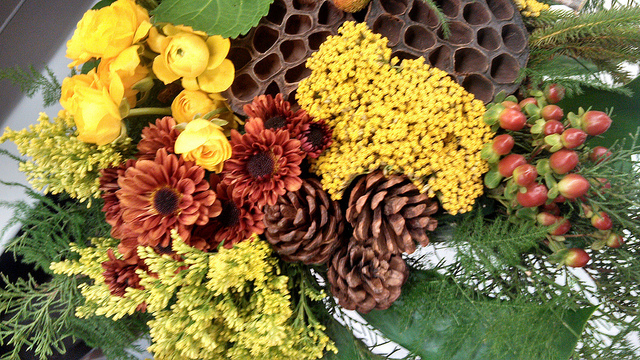 Loaded with texture, this arrangement feeds our memories of summer as we head into fall. 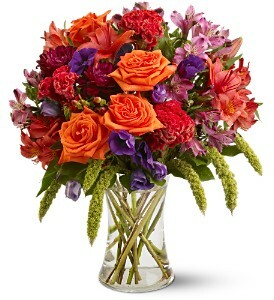 We can deliver this bouquet same day anywhere in the 617 area code and most of the 781. 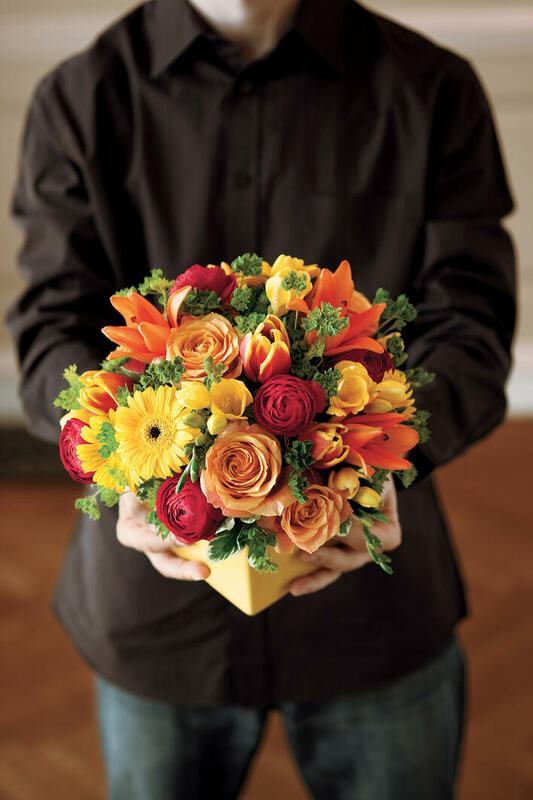 When you need a Boston flower delivery, we've been here for eighty eight years. Pick up is also available at our florist at 609 American Legion Highway in Roslindale. The kiddos are back in school after a long and entertaining summer, leaving parents the time to get back to their own business and regular schedules. For some of us, this means doing a little fall cleaning, putting things back into storage or redecorating our homes with a fresh seasonal makeover. Bittersweet wreaths, pumpkins and hay bales are popular symbols of autumn that you may see frequently along with large pots of mums dressing up neighbor’s doorsteps. 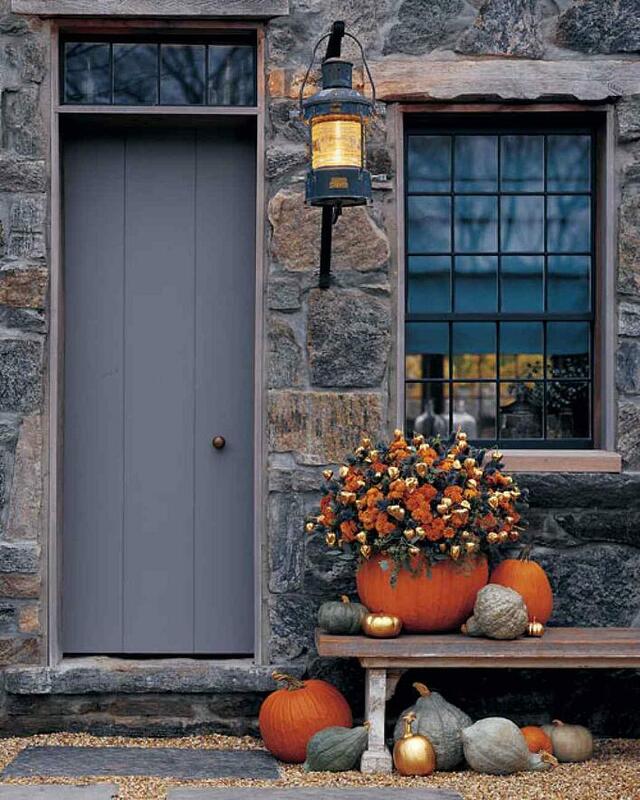 If your home appears to be vacant of these celebratory items, you may want to think about adding a bit of fall motif such as a fresh vase of beautiful flowers. Just because summer is over doesn’t mean we can’t still enjoy stunning bloomers found at our local florist! Typically, the colors you’ll see this season tend to revolve around warm and gem tinted tones. Gold, orange, crimson, bright green, yellow and sometime fuchsia are the most requested varieties by designers. This of course, doesn’t mean that you have to stick to the manual. Feel free to venture out on your own and make selections based on your personal tastes but if you want to effectively mirror the season, this is a great place to begin. You might also notice the use of natural props such as birch tree, sticks, moss, flowering branches, rose hips and bark intertwined with September/October arrangements. This tactic not only genuinely reflects the time of the year appropriately but it will also (quite often) save you money in the end since these items tend to cost less and will take up space as opposed to a vase stuffed with only flowers. 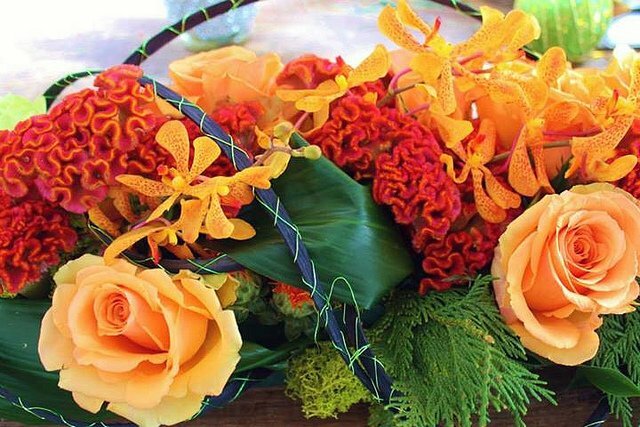 A talented designer will know this strategy and be able to make a perfect balance between the two, resulting in dazzling autumn centerpieces. Now as I said before, there are no rules which types of flowers you can or cannot use to make these bouquets but there are a few staples that most professionals agree work best. For instance, green/red hydrangea, Asiatic lilies, roses, mokara orchids, dahlias, aster and gerbera daisies are dependable picks along with Bells of Ireland, mimosa and celosia. 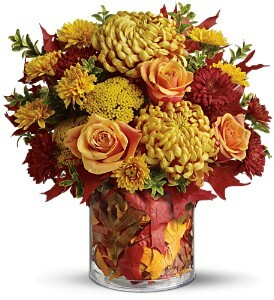 You’ll love the crisp feel to the presentation as well as adore the harvest appeal of fall flowers in New England. Fall is here but there are still some remnants of our summer gardening efforts thriving in our flowerbeds. Although many of our favorites have gone to sleep for the season, you might be lucky to find a few late bloomers poking their heads out of the ground. Many people give up taking care of their gardens when September rolls around, foregoing the watering, feeding any other important tasks but I assure you this is a mistake. There are abundant amounts of species that enjoy the crisper weather and will stay healthy for you all the way up until the first frost. Wouldn’t it be wonderful if you could steal the last remaining warmer days on your deck gazing at a garden, which is blooming well into October? Trust me- It can be done! All it takes is a little pre-planning when planting particular varieties and you could also have a plethora of flowers right at your fingertips! Especially if you are a clipper like me who loves to snip a few stems for indoor arrangements- you might want to check the below list. Picking types of blooms that will do well for you during the last end of summer to the beginning of fall are usually on the heartier side, which are resilient against a nip but also perfect for transportation from soil to water. I know… I know…. It’s beyond depressing to think about the summer ending once again but for all of you who enjoy a new season, it’s right around the corner. Autumn is surely arriving soon when the trees will turn different colors and the air will infuse a crispy freshness, which makes everything seem to smell better than it ever did before. For those of you who enjoy this change, you’re probably welcoming the transition that will become the theme for seasonal decorating, particularly if you’re living in the New England region. If you call this your home, there are definite benefits to the four-segmented panels of our calendar since each brings its own unique inspiration that can be brought beautifully inside your homes. If we’re talking about fall, then we have a plethora of material to work with, as you well know because this time of year is mirrored by rich hues and warm scents that give the sensation of coziness. Jewel tones are EVERYWHERE so you want to start here and focus on tints of gold, burgundy and emerald. 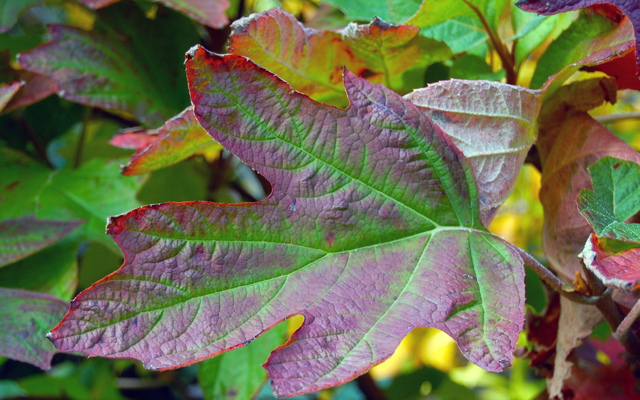 Take the maples for instance where leaves transform into orange, red and yellow – these stunners mix perfectly with sunflowers of all varieties or incredible still when left entirely alone in a clear, glass vase. Other autumn gifts, which can be easily implemented, are pinecones, twigs and acorns that have fallen from trees. These can be made into wreaths or ornaments surrounding the bases of centerpieces that give an ordinary bouquet a festive touch. During this time, foliage is at its best so you’ll want to keep this as the focus when planning floral pieces and other arrangements. Dahlias, mums, sage, aster, statice and dark hydrangea are also sure-fire winners with this motif. I was working in the yard over the weekend where I was preparing for the end of fall and the beginning of winter to arrive. I took notice of all the multi colored leaves scattered on the ground as well as the shrubbery bulging with angular branches and although it looked festive it also left a huge mess. You probably know what I’m talking about if you’re from New England and have started similar tasks to get ahead of the frost, which will surely freeze the earth to ice. I’ve always been well aware of the importance of these chores but what I didn’t realize is the great workout that can be utilized during autumn primping and preening! You’d be surprised by the amount of calories one can burn in only a half hour’s work of outdoor raking, weeding and other relatable undertakings. The bending, stretching and pulling all works crucial muscles and is just as effective as bench pressing in a gym or taking a cardio class. These activities can be ideal for supporting a stronger body and assisting with weight loss efforts in a fun and flexible manner. If you’re interested in trying this new approach to promoting a healthier and fitter you, try these simple home and garden projects that will get you started! You’re yard won’t be the only one who’ll be looking good this season! Burning calories is a snap when you pick up a rake because it’s estimated that a person can fire off over 300 in only an hours worth of work. You might want to keep in mind that the process of bagging them will charge up to another 100-200 calories. Look-it’s just part of the package when you live in the northeast that a few flakes can fall before the official start of winter. In this case, don’t be too upset about it because you can eliminate around 600-700 calories in just less than one hour. If it’s the heavy, wet, stuff, tack on another 100- 150 calories. You might not think this involves a lot of movement but in reality, holding a pair of shears and snapping away scraggily limbs can do a lot for your physique. Muscles are easily flexed and strengthened during a single half hour of this activity and can leave your arms in a firmer toned state than before. I’ve mentioned this in other summer blogs but this is so effective, it warrants re-mentioning. Weeding is a wonderful way to give your legs and arms more flexibility as well as exercising fine motor skills. Calories burned in one hour of this chore can equal over 250 and can also stimulate relaxing hormones that will leave you in a happier frame of mind. The Chrysanthemum has a long history of importance within several different regions and cultures of the world. Today, the flower meaning “gold” is seen in most flower shops and is used consistently within arrangements, particularly funeral pieces. Although they can mean love, loyalty, friendship, luck and a whole slew of other connotations, mums historically have been tied to death and mourning. In practical terms, the bloom’s impressive overall physical properties of longevity, wide spectrum of color, and year round availability is responsible for their high demand in global markets. The chrysanthemum’s sturdy stem and large head also make them a pleasure to design with as well although the symbolic significance behind the flower is its real reasoning for being the number one flower bought for this occasion. According to belief in Japan, the flower signifies peace and strength of the soul to those survived by their loved ones. Mums are continually seen throughout many festivals and are utilized in celebrations extending from religious rituals as well as weddings. The flower became such an asset to this culture that Japanese horticulturalists were the first in the world to cultivate shades outside of its wildlife hue of natural yellow. Thanks to their expertise in knowledge of the chrysanthemum, varieties now exist that include tones of red, white, green, gold and violet. As travel options increased and the floral industry widened, Japan was able to share and expose their native blooms to other countries. Slowly, mums began to pop up everywhere making a huge splash across Europe, particularly France. In the late nineteenth century, the French became obsessed with the new species and began farming the chrysanthemum in abundance along their countryside. Due to its fuss-free nature, the flower became increasingly popular where they even attached its significance to the holiday, “All Saints Day”, ironically occurring during the time when the flower blooms. Japan and France aren’t the only countries that adore this stunning species either. Australia uses the mum as the preferred choice for gifting mom with flowers on Mother’s Day and China recognizes them as one of the “Four Gentlemen” which ties into the importance of cultural artwork. In the United States, not only does New Orleans use it as the symbol for “All Saint’s Day” but the U.S. has officially deemed the chrysanthemum as the primary flower for the month of November. I’m a New Englander, through and through and that means raising a hardy garden is pretty important during the harvesting months. 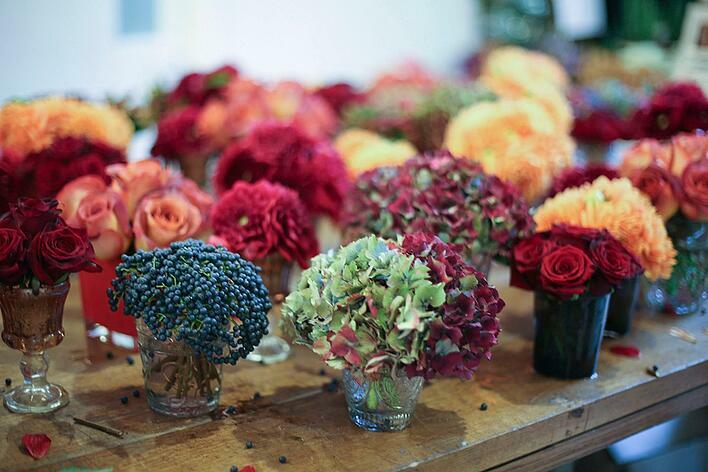 I’m also a lover of flowers having once been a wholesale florist right in the heart of the city. These two passions sometimes simultaneously combine to create new ways of putting vegetables, fruits and yes-blossoms together. 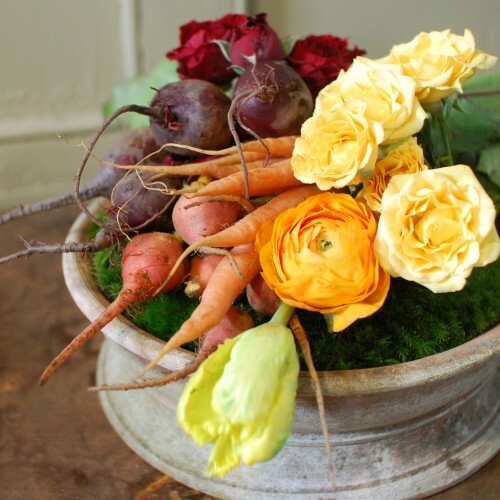 Since we’re nearing the time when gardens shed their summer food and focus more on root vegetables such as kale, cabbage, broccoli and onions, many florists are taking this opportunity to push forth-innovative ways to use the changes of the season within their daily work. Why use edibles in centerpieces when traditionally they’re used to eat? Because they too offer a boom of color and can compliment autumn floral varieties better than expensive stems that would otherwise be used as the primary product. Not convinced yet to try out this new trend? 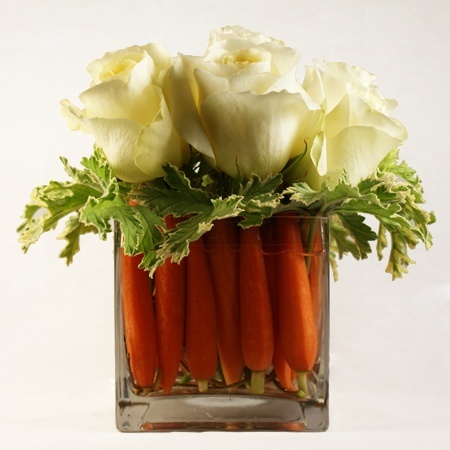 Just take a look at what some of the finest designers came up with just by adding a typical bunch of carrots to their bouquets!